What to see in Scotland? How many days do we need in Edinburgh? Should we stay in Edinburgh or Glasgow? Would you recommend driving in Scotland? Do loos in Scotland have water? The answers to these queries have differed each time, depending on the interest of the traveller – while some prefer to soak in the city life and live as the locals do, there are others who want to simply walk through the streets, popping into unexplored nooks and corners. But one thing that has been common is the list of “Absolute must see/do/eat in Edinburgh”. While I am not saying that this is the ultimate list, it does seem to have helped all those who found me through this blog or on Facebook (follow here) and Instagram (follow here). They seemed to enjoy seeing Edinburgh as seen From The Corner Table so perhaps you would too. I’ve also attached a printable list of must-see things in Edinburgh, feel free to carry the same with you. Experience says… The Edinburgh Fringe Festival (from 02-26 August this year) is easily the best time to visit the vibrant city. An enviable three weeks filled choc-o-block of entertainment of a varied kind, the festival season is a boon for the culturally and artistically inclined. The Festival time is when artists from across the world gather in one city to show off their talents – classic plays, dance and theatre, sassy cabaret performances, emotional musicals, and the Royal Edinburgh Military Tattoo. Fittingly perched on the top of a hill like a king on his throne, the grand Edinburgh Castle is a sight to behold. You simply cannot miss out on this impressive structure that looms over the city of Edinburgh like a seasoned guard. The castle tour could easily use up 3-4 hours of your day so I would recommend you fit in an early morning trip to avoid the crowd and to utilise the remaining part of a day. Book tickets online to avoid the long winding queue at the ticket window. You might want to try one of the free guided tours to get an idea of the history of Scotland and the importance of Edinburgh Castle. If shiny rocks are your thing, step in line to shuffle through a guarded hall to take a peek at the Scottish Crown Jewels which date back to around 1540 and are likely the oldest set of crown jewels in Great Britain. Walk through these gates to enter a living heritage. Built in the memory of author Sir Walter Scott, the Scott Monument is reportedly the second largest monument in the world to be built in honour of a writer. Located in the Prince Garden near Edinburgh Waverly Railway Station, the Victorian Gothic style Scott Monument manages to look both intimidating and inviting. Claustrophobia stopped me from making an attempt at climbing up the monument – the elder sister says the stairs are narrow and dark, with just one flight for those going up and the ones climbing down – but those who climb up to the pinnacle are awarded a certificate. Check it out! It’s a long climb to the top of Camera Obscura…but wouldn’t you to see the sun in your palm? Do NOT make the mistake of thinking that the Camera Obscura is “a place for children” only. This observatory-turned-experiential exhibition is the coolest and fun-nest place in Edinburgh. One of the few places that keep its doors open till 10pm (local time), the converted observatory has six floors of exhibits. With an unbeatable view of the city from the rooftop and exhibitions of optical illusions, puzzles, a mirror maze, this one is for all ages. Smaller spaces but filled to the brim with information, all museums others than the National Museum of Scotland will not take more than 30 minutes of your time each. Why you must visit all four? The National Museum of Scotland has exhibits and collections on topics ranging from Scottish antiquities, anthropology, history, science and technology, as also world culture. Created after the merger of two museums, the National Museum of Scotland is massive, divided between two connected buildings. With three storeys of a building dedicated to toys from across the world, the Museum of Childhood is the first of its kind, dedicated to understanding the term ‘childhood’ and its history. A visit to the People’s Story Museum will give you an idea of the life of the residents of Edinburgh, the life-size mannequins and documents/products salvaged over years giving a real and strangely eerie feel. The Writers’ Museum is a personal favourite. Dedicated to poets Robert Burns, Robert Louis Stevenson and Sir Walter Scott, this is where you will see personal objects used by the trio and rare books with the poets’ names etched on the pages. On the top floor of the museum is the printing press on which Scott’s Waverly novels were first printed. This one is for the diehard Harry Potter fans that can spend a fun hour looking for the tombstones that inspired the names of several characters from J. K. Rowling’s universe ­– including the much-beloved McGonagall and the once-feared Riddle. According to locals, the trek up Arthur’s Seat – the main peak of the hills near Holyrood Park – is well worth the astounding view of Edinburgh. Popular among locals and tourists alike, the Arthur’s Seat was formed by an extinct volcano system. This is also the site where excavators found a set of miniature coffins in a cave. As per urban legend, the miniature wooden figures in each of the coffins were made for witchcraft. Another popular belief was that the coffins represented victims of a pair of serial murderers. You can view the coffins at the National Museum of Scotland. With Edinburgh Castle at one end and Palace of Holyroodhouse at the other, the Royal Mile is a network of streets with some striking examples of architecture and culture. 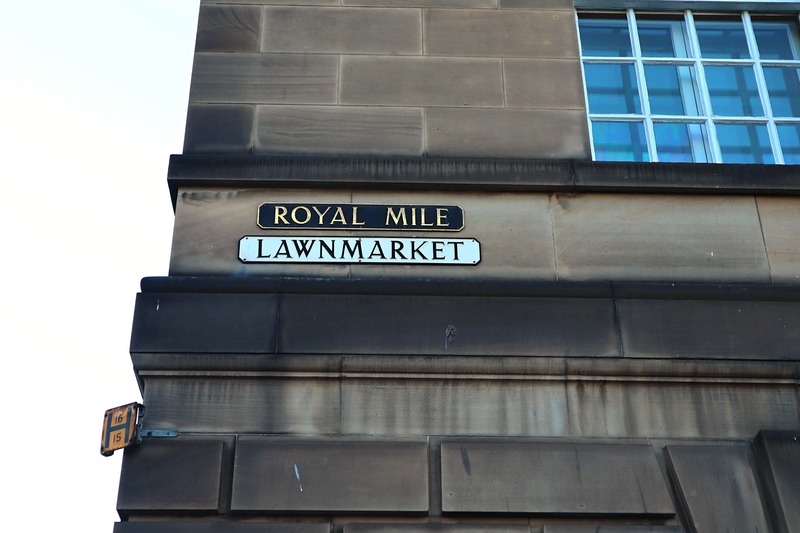 From some of the oldest pubs to new ones, stores selling handmade jewellery to tartans, whisky tasting places and sweet stores, the Royal Mile is the one-street answer for the eat-drink-shop part of your trip. A set of streets in the heart of the Old Town of Edinburgh – Castlehill, the Lawnmarket, the High Street, the Canongate and Abbey Strand – the Royal Mile is a must visit for all tourists, irrespective of age. Disembark at Castlehill and stroll up the Royal Mile towards Edinburgh Castle. Walk through the square that is Grassmarket, you would not realise it was the place for public executions between 1661 and 1668 – look down when you walk on the Grassmarket square and you will spot the memorial dedicated to over 100 Covenanters who met their deaths here. Spend some time here – indulge your taste buds. If you are spoiled for choice, I would recommend walking into Maggie Dickinson’s Pub for a drink and some food – the father opted for a local whiskey while I went for an elderflower-flavoured gin from the Edinburgh Gin Distillery. Round it all off with gelato at Mary’s Milk Bar. 9. Eat, Drink and Be Merry – the Scottish way! Begin your day with a hefty traditional Scottish breakfast of black pudding, Lorne sausage, bacon, tattie scones with grilled tomatoes and oatcakes. If you prefer to travel light, then have a quick brekkie of the traditional Scottish porridge. Let lunch be a meal of the haggis, a savoury pudding containing sheep’s pluck (heart, liver, and lungs); minced with onion, oatmeal, suet, spices, and salt, mixed with stock, and cooked while traditionally encased in the animal’s stomach (Wikipedia). Wash it down with a smooth scotch or local gin, followed by cranachan that soft, soul-satisfying traditional dessert made of fresh whipped cream, whisky, honey, oatmeal and served with berries. Alternatively, you can have the sticky toffee pudding, a gorgeous cake served with warm toffee sauce and lush vanilla ice-cream. One of the easiest and most comfortable ways to cover all these places (and more) when in Edinburgh is to book yourself a trip onboard a tour bus. Called the hop on-hop off buses, these guided tours ply on three different routes that overlap at select points. Take a look at the route maps to decide your choice of bus and hop on for a comfortable way to explore the city. I always make a checklist on my phone and keep ticking off things to do and places to see at the end of the day. The checklist also helps me plan the next day of travel and exploring. If you are up to trying this method, feel free to download this list I’ve made. Do let me know whether it helped you. Just click on the list below to open, right click and download. If you are interested in knowing more about Edinburgh, read my previous posts about the eminently crushable city.